Take care of your health and keep fit. Samsung reminds you. We all know health should be one of our top priorities, no matter you are poor or wealthy. In Galaxy S4, Samsung introduced S Health app that tracks and logs your activities and the balance of calories. There are a few sensors in Galaxy S4 measuring your motion and steps, monitoring the environment, tracking the calories you taks. For other info, for example, blood pressure, heart rate, sleep, blood glucose, weight, you can input manually or pair your health monitoring devices with the S4. Galaxy S4 and Galaxy Note 3 both supports ANT+. This means you can easily pair most fitness accessories with Galaxy S4 and Note 3. In addition to these, in Galaxy S5, Samsung gives one more sensor to monitor your heart rate and record it in S Health. This can be useful when you need know whether you should slow down your exercise. Galaxy S5 Heart Rate Monitor: how does it work? By placing your finger over the sensor on the back of the Galaxy S5 (next to the camera flash), heart rate monitor will measure your heart rate in a few seconds. During the measurement, you need keep quiet and still. For the technical point of view, Galaxy S5 heart rate monitor is different from traditional or professional heart rate sensors. 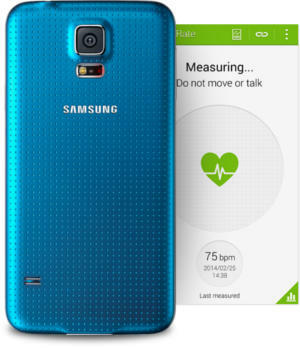 Galaxy S5 heart rate monitor uses light to check your blood flow beneath the skin. Based on the blood flow patterns (e.g., peaks and valleys), Galaxy S5 then calculates and reports the heart rate. Although the results from Galaxy S5 heart rate monitor should be accurate enough for daily usage, this is not the scientific or professional way to measure heart rate. Most professional or wearable heart rate monitors analyse Electrocardiography (ECG or EKG) signal to determine the heart rate. Such sensors detect and amplify the tiny electrical changes on the skin that are caused when the heart muscle depolarizes during each heartbeat. Due to the technical limitation, with Galaxy S5, when measuring heart rate, you must keep still and quiet. This is the un-natural way to monitor heart rate. Galaxy S5 Heart Rate Monitor: should I use it? Although Galaxy S5 heart rate monitor is not a professional tool, it should be accurate enough for most scenarios, especially for physical exercises. But please always remember you need keep still and quiet when measuring heart rate with Galaxy S5. Also, Galaxy S5 cannot monitor the heart rate continuously. You should never use it as a medical device. If you need to monitor your heart rate for medical reasons, you should check with your doctor to get a specialized device, not Galaxy S5, to do the job. So, the quick answer is that Galaxy S5 heart rate monitor is for fitness or exercise usage only. It is faster than checking your pulses, although it is not very convenient. It should never be used for medical purposes. Galaxy S5 Heart Rate Monitor: is it better than the free apps that do the identical job? You may not know there are actually quite a lot heart rate monitor apps on the Google play store. Some can even monitor your heart rate continuously. Most of them works in the same way as Galaxy S5 heart rate monitor does. Most of these apps use the rear camera to get the input. So, they probably are not as accurate as Galaxy S5’s heart rate sensor. The continuous reading can be even less accurate. Anyway, both Galaxy S5 heart rate monitor and similar apps should NOT be used as a medical device. Isn’t it cool to measure your heart rate with Galaxy S5 heart rate monitor? If you have any questions on Galaxy S5 heart rate monitor, please let us know in the comment box below. What app on the galaxy s5 can be used to scan for blood pressure? You need third-party accessories to measure blood pressure. To what level of quite do you need to be in order to get the best results, obviously if I’m on the side of the road or in the gym it’s going to be noisy around me. The noise is not an issue. You should keep still (not moving) to get best measurement. Does the heart rate monitor work with most cases available for the S5?? I think most cases should not cover the sensor (which is next to camera flash). How do I get the s health banner back onto my phone. It is just an S Health widget. You can tap and hold any blank area in home screen, then add widget. Alternatively, you can go to apps (16 dots), then switch to widget, find the widget and add it to the home screen. Password for what? If you forget your galaxy s5 lock screen password, you can unlock and reset if worth your Google account password. If you forget your Google account password, it depends on your Google account settings to reset the password. Why do I now need an account to use this monitor? It won’t work now unless I create one- no thanks! ! I would also like to know why I can not use it without setting up an account? Because the function is embedded into S health app. Samsung did not provide the stand-alone app for heart rate monitor, although it is a trivial job. It’s not worth all the hassle now, too many privacy intrusions. They should have left it alone.